Looking for a handy, healthy, no bake, portable snack? Look no further that is exactly what I have for you in today. Below there are 3 very different, but simple to make no bake fruit and nut bar recipes. Give one of these a try or create your own. These fruit and nut bars closely resemble the Lara Bars you can find in the grocery store however these ones are WAY better. You know all the ingredients that are going into these little gems. Totally customisable, don’t like cherries? Add apricots. Feeling the need for a bit of chocolate? Break up that 85% dark chocolate bar and throw it in there. Wrap them up individual and store them in the fridge, making for an excellent grab and go snack. Enough of the small talk, let’s get to it…. In a food processor, pulse nuts and sea salt until chopped (but still chunky). Some will be ground up like almond meal, some pieces will be larger, and this is exactly how you want them. 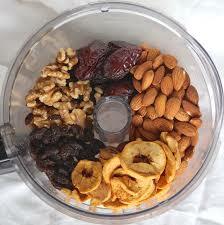 Now add dried dates, along with whatever other dried fruit you are using and spices. If the recipe calls for coconut oil this is the time to add that as well. Process until it turns into a giant sticky ball. Transfer mixture to a greased sheet of parchment paper or plastic wrap, placing another sheet on top. Roll mixture out (between sheets) till desired thickness is reached. I like mine around a ½ inch thick. Cut to desired shape and amount that suits you. Wrap tightly in plastic wrap and store in the fridge for up to 3 weeks. Bars keep very well in the freezer for about 3 months.